Gingerbread House Patterns that aren't "Cookie-Cutter"! 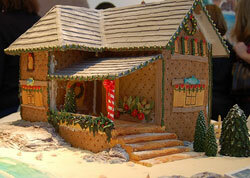 Why use the same old gingerbread house patterns that everyone uses? Our unique gingerbread templates are instantly downloadable .pdf files. If you want to try gingerbread house patterns that are a little less "cookie-cutter" (couldn't resist the pun), scroll down this page and click "Add to Cart" when you find a template you love. Easy and safe check out through PayPal (with or without a PayPal account). This castle gingerbread pattern can be made a number of ways, from quite simple to fairly elaborate: With or without a center tower and with or without turrets/cones on top of the towers. Read more. 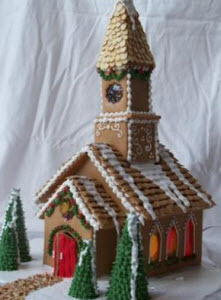 The gingerbread church template is versatile: Make an old stone church, a charming wedding chapel, or an elegant cathedral. Read more. 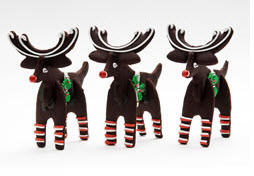 These adorable 3-D reindeer cookies can really dress up any Christmas table. Make a whole batch of them or just one single Rudolph. NOTE: This is a printable pattern, it is NOT a cookie cutter (we're working on offering that soon). Read more. This gorgeous gingerbread sleigh can be filled with candies or cookies. Makes a beautiful Christmas decoration or table centerpiece OR a thoughtful gift. NOTE: These are printable patterns, NOT cookie cutters. Read more. This "City House" pattern makes a stunning gingerbread house. It works well for a haunted mansion too! Read more. This quaint pattern makes a terrific gingerbread beach house, cabin in the woods, country home,... or whatever your imagine can dream up. Read more. 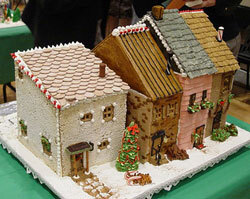 This Victorian Cottage pattern is PERFECT in gingerbread! And it's super versatile - Includes pattern pieces and instructions for 7 house styles, with varying Victorian porches (and even one tudor style house. )Read more. This Victorian gingerbread house pattern makes a beautiful creation. 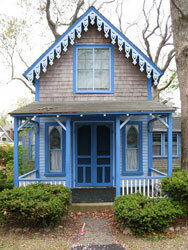 There's a REASON people call houses with Victorian trim "gingerbread houses"!Read more. 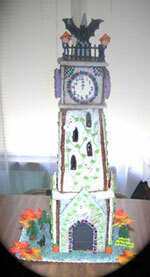 This gingerbread tudor house pattern is fun to embellish with wood trim and windows made from candy or gelatine sheets. Read more about this template. This gingerbread pattern makes a street of adorable row houses. And it's easy... Read more about this template. 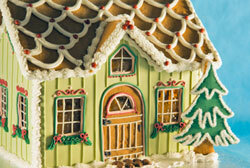 This adorable gingerbread bungalow pattern has a great return on time-investment. It's super-easy to make, but it ends up looking really special. See it larger here. This fun clock tower pattern can be used to make a spooky, haunted tower for Halloween or a beautiful classic clock tower centerpiece. Decorate it for Christmas as you might see in the center of a quaint town. Click here to read more about this template. 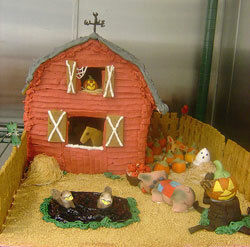 This Halloween gingerbread house pattern is super-easy to make. Get 7 patterns for the price of 3! Read more about this bundle. 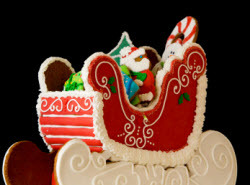 Buy both Santa's sleigh AND the 3D reindeer cookie patterns and Save! Read more about this bundle. "Loved your Gingerbread Bungalow pattern! It was very well designed and the helpful tips sure came in handy! In fact the pattern was so easy to adapt, I took some artistic licence and added a porch and chimney." "What a joy it was to build this gingerbread church!" "We had a wonderful time making this castle. Everyone helped! 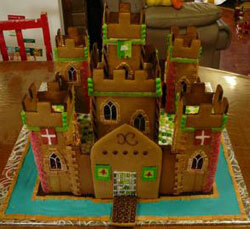 My daughter and sons helped taste test the gingerbread and decorations and made artwork for the castle. My daughter made the crows, my husband made the dragon. Of course, I was the baker and the queen of royal icing. We learned alot of new tricks along the way. The thing I enjoyed the most is seeing my family be creative together." "Great pattern. Everything worked perfectly. Also, great tips on your site. We made this for my son's grade 4 class." "The instructions were easy to print and read and it was great to have photos of the castle made out of cardboard and the inspirational photos." See more of our gingerbread pattern testimonials here. You simply print the .pdf file, cut the pattern pieces out, lay them on your rolled out gingerbread, cut along the lines, bake, assemble, and decorate. Don't forget to take pictures along the way! Problem with a Purchased Template? This is a fully automated process: As soon as you place your order, you'll receive a link to open the .pdf file with your template contents. You will also receive an e-mail with the same link (as a backup measure). If you have any problems receiving or opening the link, we'll be happy to e-mail the .pdf document(s) to you. Please click here and fill out this short form if you have any problems. 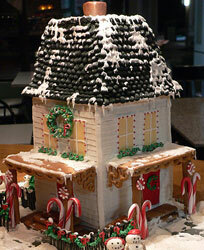 Want to make a basic, traditional gingerbread house first? Or would you just like to see a free pattern to get an idea of what to expect with our patterns? 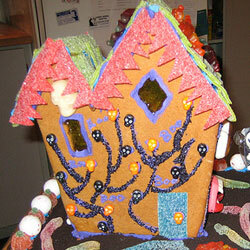 Click here to see our free gingerbread house patterns. Click the links next to the photos to open the free patterns in a .pdf file. Once you build your gingerbread creation, please come back here and share your photos and experience. Don't see the gingerbread pattern here that you're looking for? Click here to go to our Wish List page. You can see other visitors' template design wishes OR add your own wish. Be sure to attach a photo, if you have one, to better your odds. If you don't want to take your chances on the wish list, Contact Us. We can generally make a custom-designed gingerbread house template based on your photo(s) for around $50 in about a week. Fill out the Contact Us form, telling us what you're looking for and we'll get right back to you with an estimate. Return Home from gingerbread house patterns page.